Modula WMS software is the perfect complement to Modula VLM, facilitating additional management, or as stand-alone software tool for warehouses of any size. Modula WMS allows real-time warehouse management using a convenient PC interface. 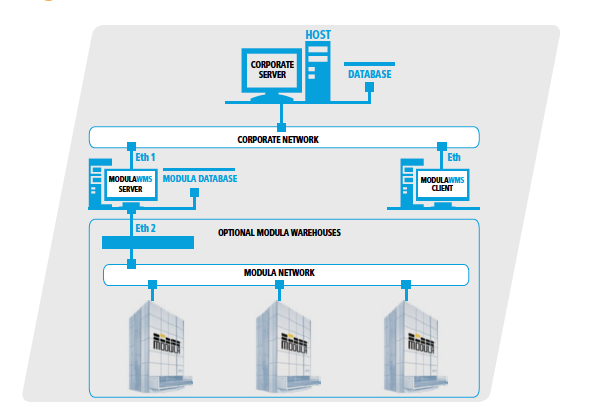 Modula WMS is easily adapted to existing corporate software systems and organizational needs. This streamlined setup has minimal impact on current procedures and operations. All you need to integrate your host system is a PC to act as the server, as well as client PCs, depending on your specific needs. WMS optimizes order management by allowing the user to speed up order execution times for both picking and replenishment operations, all with complete item traceability. WMS operating procedures are efficiently designed for an intuitive and easy to use experience, even for less experienced users. Using your data to the fullest potential in order to improve overall performance. Here are some of the other benefits of WMS software. • Repetitive tasks and procedures are automated. • Well planned material movements. • Reduced picking and replenishment errors.